Do your wants and needs revolve around having something sweet every day around 3 p.m.? Instead of raiding the office vending machine or scavenging for Halloween candy from who-knows-what year, plan ahead. By making sweets yourself, they also seem much more wholesome. If you freeze the dough you can thaw it a little at a time and be making cookies to have mid-day for a month. You don’t need to get your chocolate-covered everything at Trader Joe’s. This one step recipe is as easy as it gets. 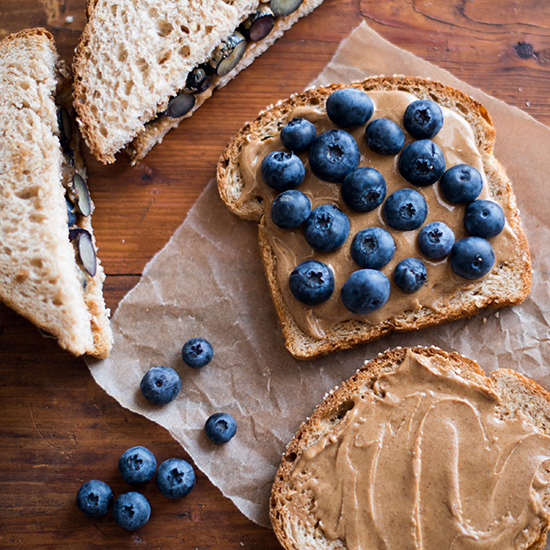 A fresher, grown-up version of the PB&J you ate everyday during elementary school. We’re starting to think of roasted chickpeas as the ultimate blank snack canvas. You can cover them in almost anything. These sweet ones are particularly addicting. Do not let anyone know you’re keeping a stash of this April Bloomfield-designed snack in your desk or it’ll be gone within the hour.